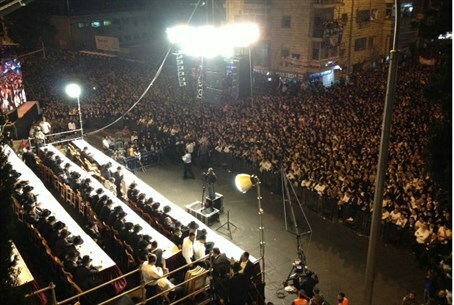 Tens of thousands of people were gathered Sunday to commemorate the life of Rabbi Ovadia Yosef z”tl. Tens of thousands of people, including a large number of well-known hareidi rabbis and yeshiva deans, both Ashkenazic and Sephardic, were gathered in northern Jerusalem Sunday night to commemorate the ending of the shiva mourning period for former Chief Rabbi and Shas leader Rav Ovadia Yosef z”tl. Rabbi Yosef, 93, passed away last Monday. The end of the shiva is being marked with speeches praising the Rabbi's work and life as well as the recitation of Psalms..